Broadway’s 62nd Tony Awards are again being beamed live to Australian viewers next month, and Whoopi Goldberg is hosting. The Bio Channel will screen the event live at 10am AEST on Monday June 16. Nominations this year are dominated by In the Heights -a musical in the Latino neighbourhood of NYC and the revival of South Pacific. August: Osage County leads the drama pack. Acting nominees include Bobby Cannavale, Patti Lu Pone, Laurence Fishburne, Rufus Sewell, Patrick Stewart, Laurie Metcalf and Martha Plimpton. Stephen Sondheim will receive (a long overdue) award for Lifetime Achievement in the Theatre. Bio will repeat the Tonys the same night at 8:30pm. 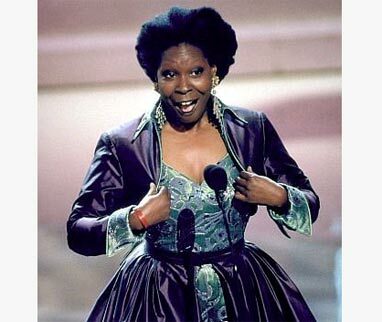 The View’s Whoopi Goldberg will host THE 2008 TONY AWARDS, to be broadcast live and exclusive from New York ’s Radio City Music Hall on FOXTEL’s Bio. Channel in Monday, June 16, from 10.00am AEST. The Tonys were founded in 1947 as a memorial to Antoinette (“Tony”) Perry, the American Theatre Wing’s World War II chairperson. The Tony is one of the most coveted awards in the entertainment industry and the annual telecast is considered one of the most prestigious programs on television. These awards celebrate theatrical achievements across the board including acting, direction, choreography, lighting, costume, set design and the special Tony award for Lifetime Achievement, which this year will be presented to Stephen Sondheim. Currently the moderator on the talk show The View (exclusive to W. in Australia), Whoopi Goldberg is herself a Tony Award winner. She was honoured in 2002 as the Producer of Thoroughly Modern Millie, which then entered her into an elite group of artists to have won a Grammy, an Academy Award, a Golden Globe, an Emmy and a Tony Award. Marking 62 years of excellence in Broadway, The 2008 Tony Awards’ ceremony will be the most glamorous night of the Broadway season with dozens of stage and screen stars on hand to present the awards. Leading this year’s nominations tally are two musicals: In the Heights, with 13 nominations, and Rogers & Hammerstein’s South Pacific, with 11 nominations. Other productions to have earned multiple nods include Sunday in the Park with George, August: Osage County, Gypsy, Boeing-Boeing, Macbeth and Gypsy. Best Performance by a Leading Actor in a Play – Ben Daniels for Les Liaisons Dangereuses, Laurence Fishburne for Thurgood, Mark Rylance for Boeing-Boeing, Rufus Sewell for Rock ‘n’ Roll and Patrick Stewart for Macbeth. Best Performance by a Leading Actress in a Play – Eve Best for The Homecoming, Deanna Dunagan for August: Osage County , Kate Fleetwood for Macbeth, S. Epatha Merkerson for Come Back, Little Sheba , Amy Morton for August: Osage County. Best Performance by a Leading Actor in a Musical – Daniel Evans for Sunday in the Park with George, Lin-Manuel Miranda for In the Heights, Stew for Passing Strange, Paulo Szot for Rodgers & Hammerstein’s South Pacific, Tom Wopat for A Catered Affair. Best Performance by a Leading Actress in a Musical – Kerry Butler for Xanadu, Patti LuPone for Gypsy, Kelli O’Hara for Rodgers & Hammerstein’s South Pacific, Faith Prince for A Catered Affair and Jenna Russell for Sunday in the Park with George. Best Performance by a Featured Actor in a Play – Bobby Cannavale for Mauritius, Raul Esparza for The Homecoming, Conleth Hill for The Seafarer, Jim Norton for The Seafarer and David Pittu for Is He Dead? Best Performance by a Featured Actress in a Play – Sinead Cusack for Rock ‘n’ Roll, Mary McCormack for Boeing-Boeing, Laurie Metcalf for November, Martha Plimpton for Top Girls and Rondi Reed for August: Osage Country. Ricky Kirshner and Glenn Weiss of White Cherry Entertainment return as executive producers of the Tony Awards. Weiss, who won an Emmy Award for the 2005 broadcast, will also serve as director for the eighth consecutive year. Elizabeth Ireland McCann returns as managing producer and Joey Parnes will serve as coordinating producer for Tony Award Productions. from 10.00am AEST on Bio. With a special encore screening at 8.30pm AEST.